This post helps PR and Marketing people understand and productively work with IPVM (as much as possible given our independent, often critical, position). It may be useful for others as it talks about our philosophy and positioning. While IPVM is most known for its stances on industry issues, IP Video Market Info was not found to do that. However, a few months after the site started spidering / collecting links, we added commentary on those links. It led to posting about product news and quickly grew to 10,000 monthly visits. During 2008, it was a free experiment. At the beginning of 2009, we started the membership service (a few dozen signed up the first week). In 2012, we added online training (with now 800+ per year trained. Overall, now in 2018, we have 10,000+ members. IPVM has no external funding nor ownership, is debt free and continuously profitable since 2009. 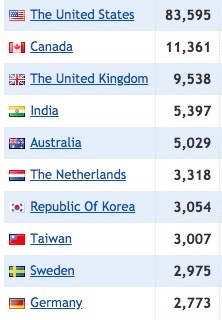 IPVM has ~550,000 page views per month, or roughly 3 per visitor. In the first year following publication, after the first month, articles average an additional 50% more reads. So if an article received 1,500 reads in the first month, in the next 11 months, it would typically get ~750 more reads. Whether the article is free or not rarely makes much difference for readership. There are only so many people in this relatively small industry who want to read an article about codecs or Exacq's new recorder or Axis' 138th dome camera. The main exceptions are stories that show up high in Google search results but those are generally tutorials or general topics as Google search traffic for niche industry terms is comparatively low. 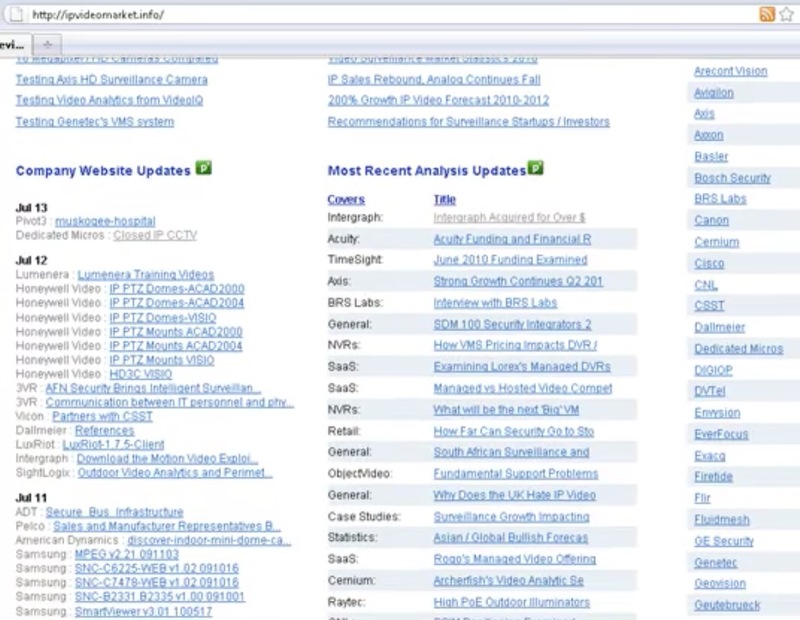 One exception to that exception is the Hikvision OEM Directory, which has been viewed 27,000+ times in the last year, largely from search traffic. 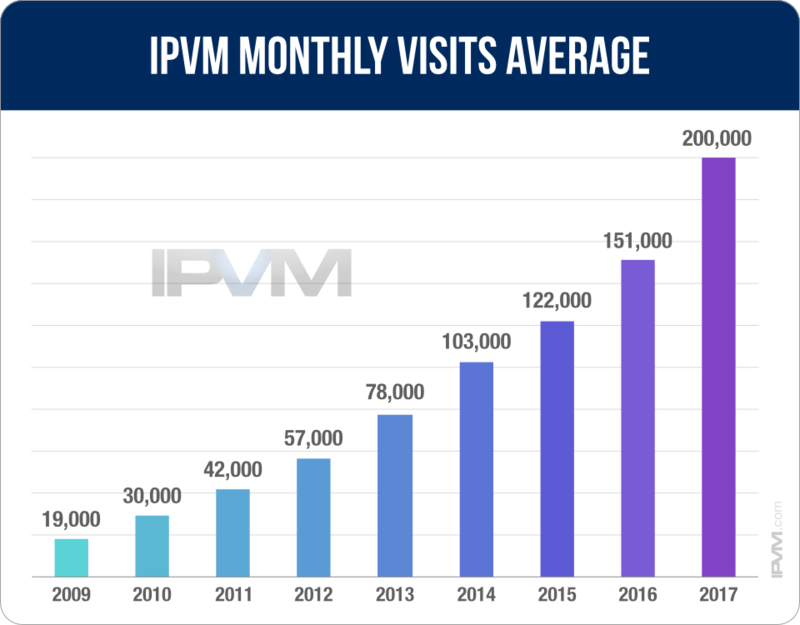 IPVM has more online traffic than any other media source / publication covering the video surveillance industry. Trade magazine websites tend to have in the range of 50,000 to 100,000 visits per month and under 200,000 page views, despite the benefit of being free / public. We publish ~50 original articles each month, which is far more than any other source as most sites re-run press releases or manufacturer marketing material (e.g., case studies). That our articles are original and that they take strong positions are key drivers to our traffic. From a PR / marketing standpoint, we are (sadly) the only industry media that will regularly take strong positions on issues, especially being critical of major companies. A significant part of our impact comes from this role. IPVM makes all its money from low-cost subscriptions and online training fees. We do not accept advertising nor do we have any consulting projects or any other arrangements with any manufacturer. Manufacturers commonly threaten media with pulling advertising payments. Those threats are extremely powerful for other media sources but are useless to us. That is why we can call out any manufacturer at any time without any fear of undermining our business. If you wonder why trade magazines almost only write about their advertisers or republish articles manufacturer submit, this is why. Readership is super low and it cannot justify original reporting. 10 - 20 years ago, when print was in its heyday, trade magazines had lots of money and no competition from the Internet / Google / manufacturer website, mags could invest in numerous in-depth articles. This is long gone and most trade magazine websites average a few hundred reads per press release, case study or 'thought piece' they run. While we do not care about manufacturer money, we do deeply care about getting things right technically. If a company feels something is wrong or incomplete, we want to know. The best thing to do is have a technical / product person reach out to us and explain. By contrast, having a PR agency tell us they are unhappy will not result in any change. We are not neutral. We are not trying to be the 'Switzerland' of security technology. We are independent and technically grounded. We are not impacted by manufacturer money. Rather, we always seek to ground our opinions on research/testing, frequently unique work done nowhere else in the industry. Our experience with PR firms shows that most deliver poor value and that the larger the firm (e.g., LRG), the lower the value is, as their charges to manufacturers go up and their antiquated processes remain. Many PR firms are still built around the broken model of pushing out boring marketing fluff and paying / paying off trade magazines to run their ads / 'thought' pieces. First of all, undoubtedly, this approach is useless to us. Every time a PR person sends a stock 'please post this press release' email to us, we shake our heads and genuinely feel bad for the manufacturers who pay them for this spam approach. Most of these PR firms wind up not even trying to contact us, which clearly lowers their overall value proposition to manufacturers. Secondly, the old school PR approach will wind you up with press releases in a handful of publications but with very few actual reads. Indeed, we continue to strongly recommend LinkedIn as a much more powerful and useful marketing alternative (indeed, we spend with LinkedIn ourselves). We do generally accept embargoes - which are effectively pre-briefings on news (typically products) that are not yet released with an agreement that we will not report on it until the company officially announces it. Doing so helps us get detailed questions answered that improves our coverage as well as helps the company better understand our concerns and potential criticisms up front. If we already know of the news through other sources, we will tell a company up front that we will not accept embargoes. That said, since readership in this industry is so low (compared to Apple news or national politics), we have little incentive to break embargoes. Equally important, we see the value of IPVM to our members in the analysis we provide, not the sheer fact of reporting first. We regularly speak to manufacturers off the record, which means we will not print what was said in phone calls. The goal there is to let execs or marketing people explain their issues / concerns or point of view without fear of being ambushed or misquoted. The reality is that with our product testing, integrator surveys, general knowledge, public materials, etc., if we find something to criticize, we can do so based on that. Calls are a chance for a company to clarify things and understand what our concerns are. We are open to talking to any company in the industry that we cover. For example, for a while, we spoke regularly with Hikvision and they readily gave us feedback on their products and positioning. They were very happy to get what is essentially free exposure from us. Then shortly after we started to report on their Chinese government ownership, they banned communication with us. That is not the first time a manufacturer has done so, it will not be the last. It certainly does not prevent us from reporting on a company but it does make it harder for the company to share their viewpoint, which certainly hurts them. If companies want to restart communications (e.g., we talk with Arecont and Avigilon now and Hikvision is trying to communicate with us), we are happy to do so but we will certainly continue to do product tests, conduct surveys, issue analysis, etc. with or without official communication. As long as PR / marketing / execs are willing to speak honestly with us and not to try to push to run their canned marketing content, we are happy to speak with them. IPVM extensively uses social media. This explains what we use and why we use each one. On LinkedIn (IPVM Page - 15,994 followers), we focus our content on business topics for industry people. We have found that lots of executives at integrators and manufacturers regularly read LinkedIn updates. Commenting on LinkedIn is not that high but whether it is negative or positive, generally, it is coherent and thought out. On Facebook (IPVM Page - 1,559 follows), we focus more on SMB related content (in particular alarm topics do well, e.g. ADT vs Vivint). From reviewing reactions and comments, Facebook skews more to technicians and small dealers. They comment heavily but it is regularly juvenile or promotional. We will continue to post on Facebook as it helps expose us to a broader audience and generates some interesting feedback (e.g., "IVPM Is A Self Proclaimed Garbage Heap"). We advertise on LinkedIn, Facebook and Twitter, generally to promote posts we see getting high engagement and somewhat for general brand building. We find it an extremely cost-effective way of introducing people to IPVM and keeping IPVM top of mind for large numbers of people at comparatively low cost. If you want to talk about anything else, feel free to leave a comment or email us and we will respond.